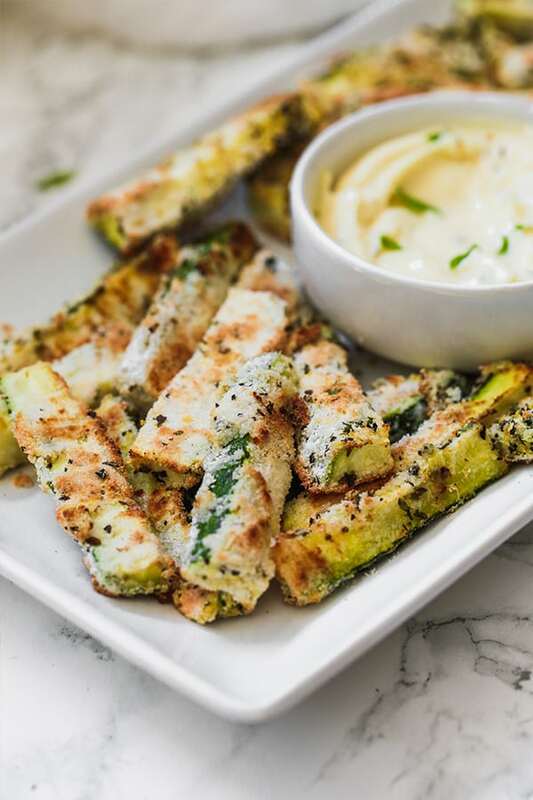 These baked low carb zucchini fries are crispy and delicious! They’re made with coconut flour and are nut free, egg free, dairy free, paleo, keto, and AIP compliant. Zucchini season is in full swing, and I am all about it! When I’m not putting zucchini in dishes like my one pot lasagna or zucchini brownies, I tend to default to putting it in the oven. However, zucchini tends to get a bit mushy in the oven. You have to watch it incredibly carefully to make sure it cooks perfectly. 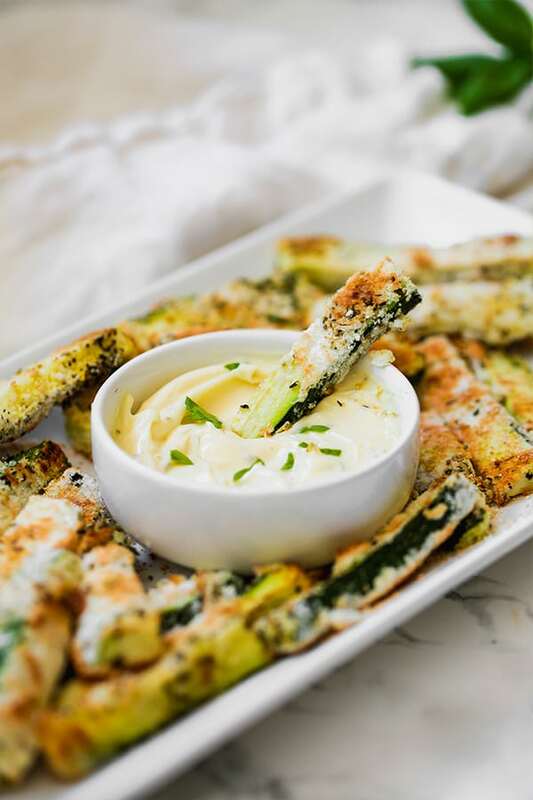 These low carb zucchini fries are such a delicious side dish or appetizer! They’re great for dipping into a sauce of your choice, and are made without any dairy, grains, or nuts. 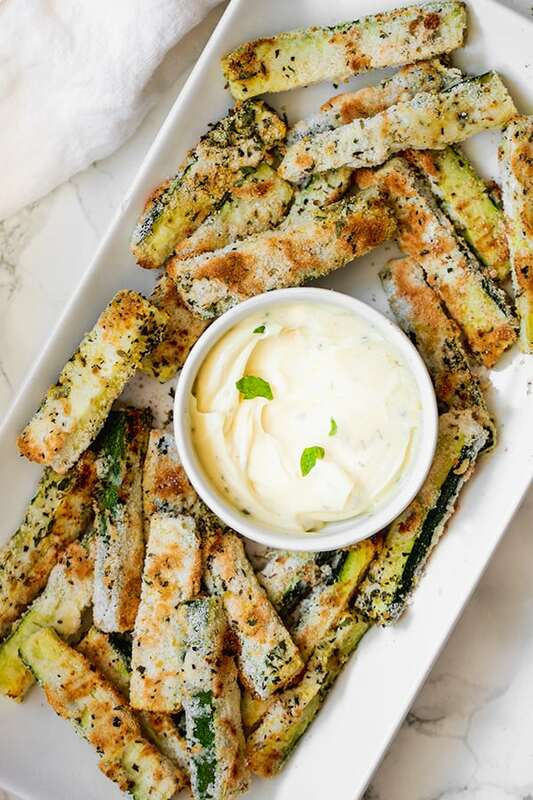 Most zucchini fries that you’ll find recipes for online are made with Parmesan, eggs, and almond flour, but not these! They’re totally AIP compliant and great for bringing along to a party where there are a lot of allergies. It wasn’t easy to make a zucchini fry recipe that was egg free, grain free, nut free, and dairy free. It took me several tries to get the coating to really stick without eggs, but it really is possible! The coating for these fries is made with coconut flour, and features a blend of herbs and added nutritional yeast to give the fries that cheesy flavor without the actual dairy. All you have to do is coat the fries in coconut milk (or almond milk if you tolerate it) and roll it in the coating. Super simple! You can even do it with kiddos! Another thing that I love about these fries is that they’re baked! Frying in oil is so expensive when you’re using good quality oil, not to mention it’s just messy. Baking these fries is cheaper, it’s easier clean up, and it’s easier to just set in the oven to come back when it’s done. I used two large zucchinis sliced into fries for this recipe, but you can use whatever size you have on hand. Full fat coconut milk is what helps the flour coating actually stick. You can try using almond milk if you tolerate it, or eggs if you tolerate those as well. Coconut flour is the main coating ingredient and keeps these low carb, and nut free. Coconut isn’t actually a nut, and it works great for these fries. If you’re not a coconut fan and can tolerate nuts, there are lots of recipe out there that use almond instead, but I haven’t tried any other flours for this specific recipe. The dried herbs give these fries tons of flavor, and the nutritional yeast gives them that cheese-y flavor! This recipe is made with a garlic mayo that really compliments the flavors! You can use a pre-made paleo mayo, or make your own AIP mayo. You can also use the green goddess avocado dip in this recipe, or a compliant marinara sauce like this AIP marinara. Preheat the oven to 400 F and line a large baking sheet with parchment paper. Prepare the zucchini by washing well, and chopping off the ends. Slice the zucchini in half, then chop the halves into fries, being mindful to keep the peels on each fry. Using a large bowl, mix the coconut flour with the seasonings until well combined. Set up a station with the coconut flour mixture in one bowl, and the coconut milk in another bowl. 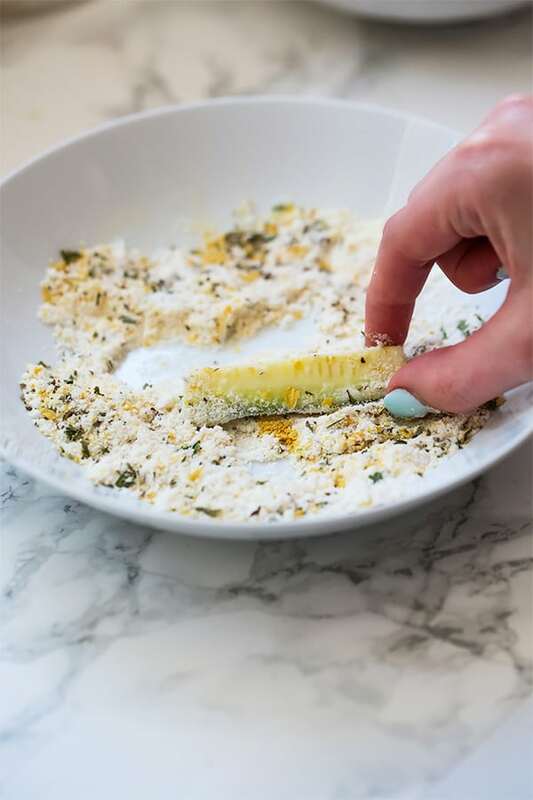 Dip the zucchini fries one by one in the coconut milk, and then the flour mixture. Make sure the fries are evenly coated. Place the fries evenly spaced on the baking sheet and bake in the oven for 25-30 minutes, flipping halfway through. Serve with a dipping sauce and enjoy! Combine all of the ingredients in a small bowl and mix well. Season further to taste. For this dipping sauce, you can also use the green goddess avocado dip in this recipe, or a compliant marinara sauce like this AIP marinara. These look amazing! Do you think these could be made in an air fryer? You can try! I haven’t played with the air fryer much so I don’t know how to adapt it for that. Let me know if you do! Uh, YUM!! These look absolutely incredible – I have some HUGE zucchinis in my fridge, waiting to be made into fries!